This talk is about errant drone aircraft. A drone sunk in 500 fathoms of water off the coast of San Diego in 1937. A fragment of a D-21 drone launched over China in 1969 returned to an American CIA agent as a present from the KGB in the 1980s. A crashed Israeli drone reported by an Egyptian news agency after the Arab-Israeli War of 1973. An American spy drone crashed in El Salvador in 1985. A drone rumoured to have flown from the African continent to Israel in the early 2000s. Drones flown in Bosnia described in a 1995 Los Angeles Times article as having ‘crash[ed] like apples falling off a tree. The history of experimental, pilotless planes is woven through the 20th century, and countless systems presage their contemporary use. Most drones were widely regarded as failures and drone aircraft were typically ‘dummy’ planes of the Cold War. Chandler returns to these histories to explore how unmanning is enacted. Early drone aircraft resist the narrative that the systems are a recent technical innovation underwritten by the War on Terror. Rather, the crashes suggest that the supposed technicity of drone aircraft ties to political contexts and is underwritten by human action and interpretation. Chandler explores the drone’s dysfunction as a means to study the violence made possible by their networked human, media, and machine parts. Error underscores that the ethical challenges of drone aircraft is not simply that they are dehumanizing. Rather, they produce flawed and partial ways of seeing and acting that are conceived politically and legally as total. Looking back to the moments when these views failed spectacularly, she considers how errans can be a way to counter the obduracy of a dronelike worldview and the politics it imbricates. Katherine Chandler earned her PhD in Rhetoric at the University of California, Berkeley and is currently an assistant professor at the Walsh School of Foreign Service, Georgetown University in the Culture and Politics Program. She was artist-in-residence at The Case for Space at ‘Provisions: Art for Social Change’, George Mason University in 2013 and The Decapitated Museum at Banff Centre for the Arts in 2012. She is currently working on two book projects The Technopolitics of Unmanning: How Humans, Machines and Media Assemble Drone Warfare and Drone Publics. Her articles, essays, and photographs have been published by Catalyst, Humanity, and qui parle. She contributed to the recent anthology Life in the Age of Drone Warfare (2017). 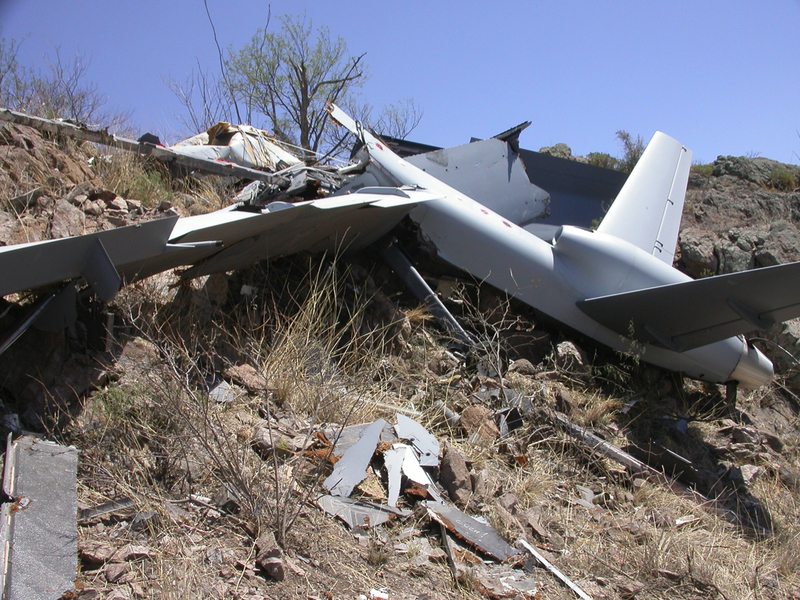 © The remains of a Predator B ‘Reaper’ drone, operated by Homeland Security, sprinkled across the Arizona mountainside, in this April 2006 photo released by the National Transportation Safety Board.